Part of my impetus for merging documentary with live performance is the influence of my colleague and frequent collaborator Brent Lee. Brent is a composer, media artist, and musician among other things. He’s brilliant and he’s busy. 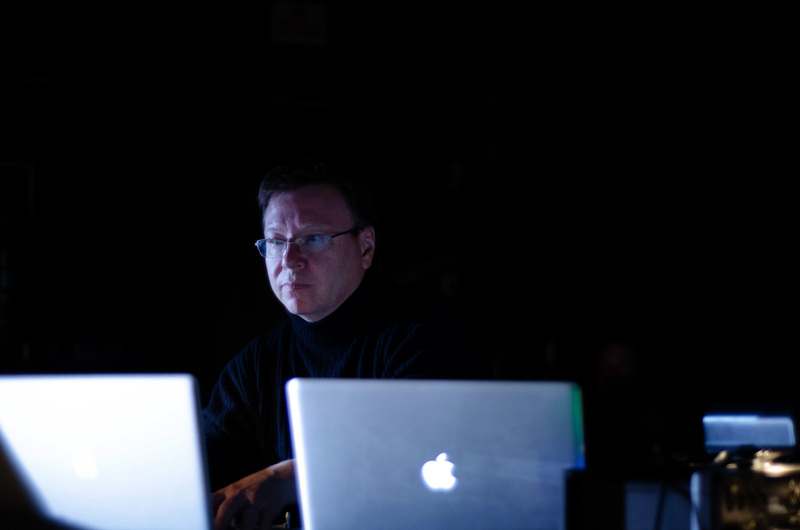 He’s created more than 100 works, from orchestral music to interactive media pieces and film soundtracks (including scoring and recording the soundtrack for every film I’ve made since I moved to Windsor in 2005). His work has been performed and recorded all over the world; and the list of awards and grants he’s received is longer than your arm in 8 point font. I first met him very soon after I was hired as a film prof at the University of Windsor in 2007. He passed me in the hallway, stopping to introduce himself and invite me to contribute footage to his multimedia performance series. When I first met him I was overwhelmed with my new job but I thought about the invitation a lot over the years and attended his performances all the while. In the back of my mind I always wondered what it would be like to combine Brent Lee’s audiovisual performance work with narrative video. It is with those thoughts swirling through my mind that I have been conceiving an approach to narrative-infused audiovisual performance. Click here to find a sample of Brent Lee’s work with the Noiseborder Ensemble, featuring music by Brent Lee and Nick Papador (performing), alongside Sigi Torinus’ evocative and arresting visuals, from a 40 minute performance documentary I shot of their piece Subatomic Time.